Post-Punk Cinema Club: The PPCC's famous! Howdy doody, kids! What time is it? Well, we're currently on the cusp of a dawn, but it's also... FAMOUS TIME! "Bollywood blogbuster", Indian Express, 21 December 2008. "The Bridge of Indotalian", Tehelka, 18 December 2008. "Movie-love in cyberspace", Business Standard, 28 June 2008. 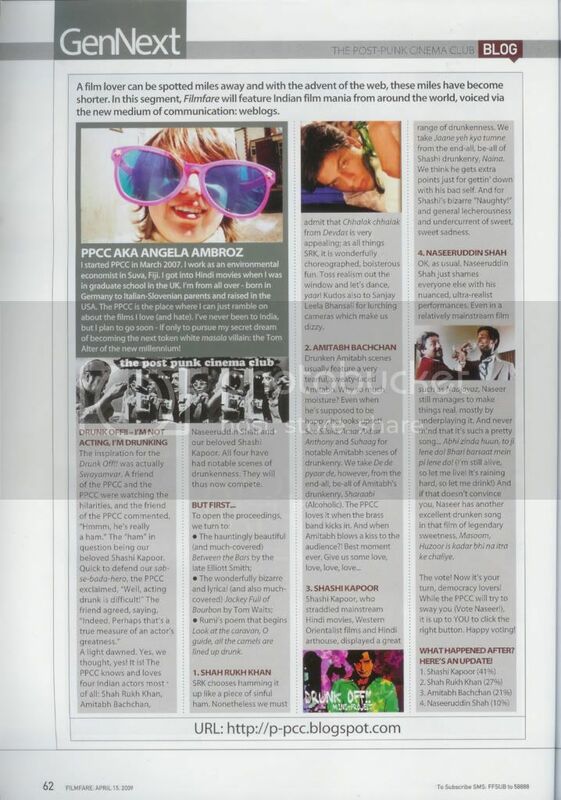 GenNext: The Post-Punk Cinema Club, Filmfare, 15 April 2009. Manmohan Desai & the Women, Masala Zindabad, 29 July 2011. Check back for updates, insha'Allah! Vah vah! Congratulations to the Internet discovering how great the PPCC is!! Congrats! :) I LOVE this blog! What just-ann-now said: Ji hah.n hai! LOL You deserve every bit of recognition you get! I'm really happy that your hard work and excellent reviews are not only pleasing bollywood blogger, but educating everyone else as well. Congrats! I particularly liked the article in Tehelka comparing Indian and Italian cinema. Next in your list of Anil Kapoor's movies is perhaps "Saheb"? Completely agree with you on Indotalia. There was also some neorealistic cinema in Hindi before the 70s. 'Do Bigha Zameen' for instance, and maybe 'Mother India' qualifies too, though it's also heavy duty melodrama, and 'Naya Daur'. Thanks, all you homies and warm, friendly readers! And thanks especially for commenting - it makes the PPCC's heart start glowing a la E.T. !